Dollhouse meets disaster in Do Ho Suh’s new installation at Lehman Maupin gallery in New York. 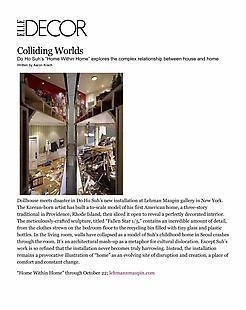 The Korean-born artist has built a to-scale model of his first American home, a three-story traditional in Providence, Rhode Island, then sliced it open to reveal a perfectly decorated interior. The meticulously-crafted sculpture, titled “Fallen Star 1/5,” contains an incredible amount of detail, from the clothes strewn on the bedroom floor to the recycling bin filled with tiny glass and plastic bottles. In the living room, walls have collapsed as a model of Suh’s childhood home in Seoul crashes through the room. It’s an architectural mash-up as a metaphor for cultural dislocation. Except Suh’s work is so refined that the installation never becomes truly harrowing. Instead, the installation remains a provocative illustration of “home” as an evolving site of disruption and creation, a place of comfort and constant change.